A passion project targeted at a particular woman, Love, Time Is Gone features high-flown language, lambent rage, and nearly mythic stakes. 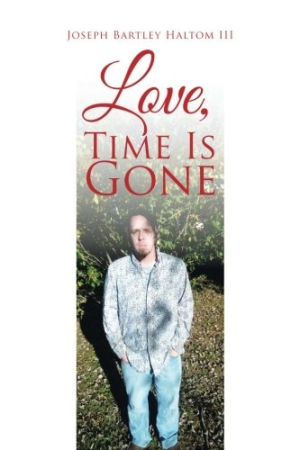 Dedicated to a woman named April, Joseph Bartley Haltom III’s Love, Time Is Gone is a deeply personal collection of poems that makes a secret passion public for an audience of one. The dedication and afterword state that the book is “the first publication of a much more elaborate attempt to win her heart whether anything happens or not between them.” This assertion sets the tone for fifty-two poems and four short essays that veer wildly in their emotions and content to express wounded resentment toward a woman and world that won’t recognize the speaker’s declared superiority. The poems show a callow understanding of genre conventions and forms. Caesuras equate to breath pauses or phrasal units, and line breaks are followed by ellipses or commas, with the exception of final lines, which end in periods, as if each poem was a lone, attenuated thought. There’s scant attention paid to poetry’s aural pleasures beyond a smattering of end rhymes, while metaphors, similes, and personifications of nature are heavy hitters. Most affecting is their author’s direct indication that there’s very little, if any, separation between the writer and the speaker of these poems, which makes the work personal and only liminally literary. Although the book is dedicated to the object of the author’s affection and largely focused on their relationship, the nature of that relationship is unclear. It is variously depicted as a secret passion, unrequited love, a marriage that ended in divorce, a fated match, and a failed connection between star-crossed lovers; it’s hard to discern how much of the relationship is fantasy and how much is reality. April is a “queen,” an “angel,” a “goddess,” the ideal mother, simultaneously “wicked” and “perfect.” Her personhood is eclipsed by this hyperbolic language that is full of familiar abstractions, idioms, and tropes. But know that I can’t be stopped by all the world’s wrath. The overtones of violence in this love can’t be ignored. It manifests in increasingly broad strokes, including the closing essays focused on religion and racial purity, which have tones of anti-Semitism and misogyny. Often withholding and vague, these poems reach for both generalizations and absolutes, as if the speaker can’t bear to draw any closer to particulars that would clearly communicate and evoke the complexity of his situation and the emotions it’s caused. A passion project targeted at a particular woman, Love, Time Is Gone features high-flown language, lambent rage, and nearly mythic stakes that occlude rather than heighten the human drama at its core.